I am re-posting this spot for new readers to see. The question keeps coming up, "Can you bee seen on the road while riding a recumbent?" The responses to the article were the best, so if you can, please comment with your opinions to help share the experience of what it is like on the road riding a recumbent. The worry for new shoppers of recumbent bicycles is if while riding on roads, "Can you be seen?" The question with today's drivers is , Are they watching the road? Cell phones and now texting has drivers looking less at the roads for anything else then a car. The chance of getting hit and hurt while driving your car by another car has divers more aware of automobiles then pedestrians and cyclists alike. Bicycles for the most part slow traffic down. Cars when aware take their time passing and in most cases pass at a safe distance. Once in a while I have been passed too close for comfort. I'm never sure if the driver ever saw me or they were passing at a distance that they felt safe at. Oddity's on the road have drivers watching. Not sure of what there looking at, has drivers at times not wanting to pas. You see them in your rear view mirror causing other drivers to stack up in back of them. Somewhat awkward, I wave them on letting them know that I can see them fine and it is safe to pass. Always afterwards, I see their eyes in their rear view mirror. I love to wave and then have them wave back. Its hard to notice how much you are acutely seen and if drivers are letting you pass by being polite. Its not until I find myself back on an upright style bike that I get cut off, sometimes as much as 3 times a ride, and realize that while on a recumbent, drivers not sure of what their seeing, will wait and not come out in front of you. With a rear view mirror and the "Heads Up" style of riding, on a recumbent, you see everything! A cold weather cycling destination can be anywhere you might think up. 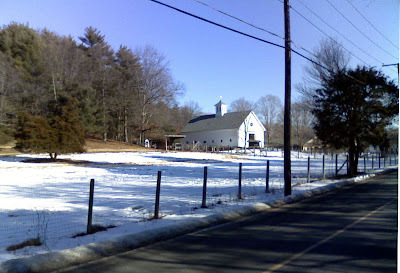 Home to a warm house could be just that good enough, but for those of us who like to ride with our head up and are looking for adventure in our rides, New England has many. I always want a few details in the arrival of the destination to be somewhat the same. The stopover needs to be both a warm spot and a safe place to park the bicycle. We are lucky here in Southern New England to have many. Meeting at a coffee shop for a cup works. You usually have the windows to watch the bicycles and warm drinks to bring you back to life. Its always a good spot to start a ride for the simple reason of being able to wait where its warm. 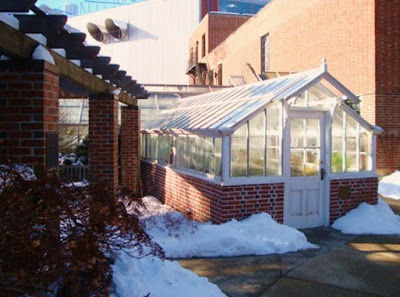 One of my all time favorite Cold Weather Destinations is the Wellesly Collage Green House's. On the Wellesly campus, the houses are open to the public from 8:00-4:00 every day of the year. The perfect time to go is when its really cold out and really sunny. A little bicycle ride to the tropics. This has been a favorite of ours for years and although never crouded, usually attracts interesting folks to meet while there. Over the next couple of months, I will be spotlighting spots of interest to ride to and keep you on the road and off the trainer. Im Back in the Arm Chair Again! You know your hooked when you find yourself thinking about riding your recumbent when your doing other things. You can be miles away from your bike and in your head, right there in the seat. I first imagined riding a Recumbent years before I owned one. I had this vision of riding down Wayside Inn Road in Framingham after a stop at the Tavern at the Inn. The day dream was with a group of people on Recumbent's as well. Three years later the dream was realized. Fast and fun, I have now done that exact road many times. There is no better bicycle for a road trip then a Recumbent. There is a much better view, more comfort and when you stop, the odd machine arracks passer by's. I love meeting new people and a Recumbent is the perfect tool for the job! If your reading this and have never ridden a Recumbent Bicycle, it may be hard to imagine how great a design it is. 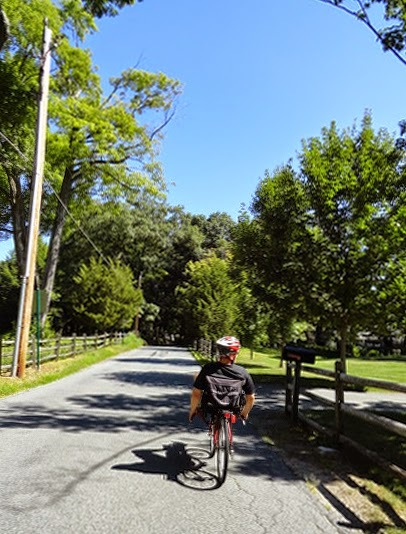 Of course it looks a little odd, but sitting back and seeing the sky, trees and the view that most "Heads Down" cyclists miss is enlightening and such an attract to have you thinking about your next adventure! Hot in the Sun, Cool in the Shade! What a beautiful day for a Recumbent Adventure! Two bicycles and two riders. Vision R40's, under seat steering, short wheel base. Just perfect! I had not been on a recumbent for a while so frankly, I was a little worried. After a mile, no problem! Its like they say "You never forget how to ride a bicycle!" The perfect day and the perfect bike. First stop, The Bacon Free Libary. A quick stop to say hello and move on. Next Stop, Lunch. Just down the street about 100 yards. A great little Mexican Restaurant called The Aztec. outdoor seating. The food was better then I expected and served in style. Low priced and high quality, just the way we like it! Heading East to Natick center, we stopped at "Listen UP" a store selling used CD's. You can never really be sure what you will find there. A great ride was had by both riders. The only thing that would have made it better would be you! 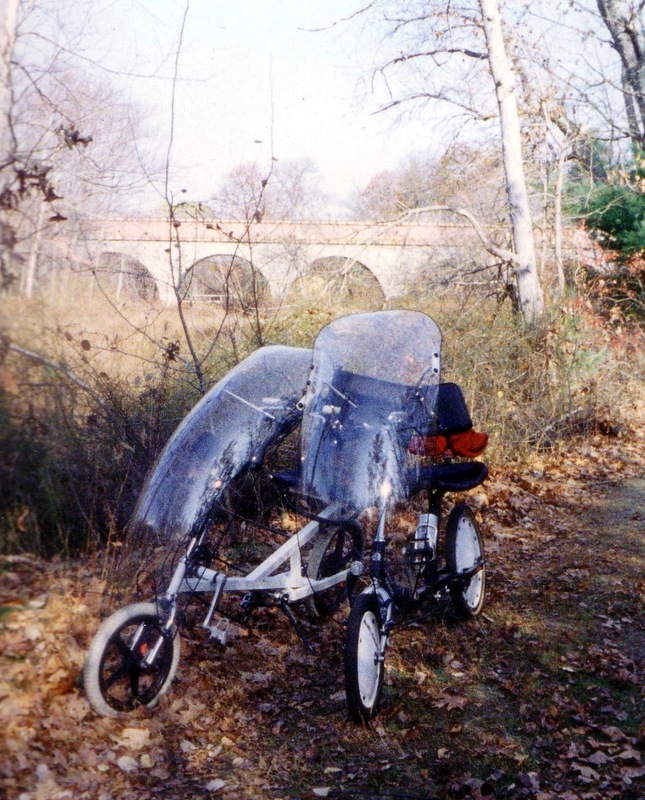 The question comes up a couple of times a year if a fairing is a good idea for a recumbent bicycle. At this time of year it is one of the best accessories I have ever owned. Fairings are very expensive. Because the failure rate of blowing such a large plastic bubble, the cost of lost plastic sheets is part of the expense of your new fairing. Both Zipper and Mueller have a replacement special price if you have a problem within a certain time of ownership. Both are very reasonable. Fairings scratch almost the very moment you set them up. Its almost impossible to keep them scratch free. There is polish to make them look better, but I have never been able to remove scratches. The polycarbonate plastic is not optically correct. The view looking through the plastic is very distorted and not recommended. I have tried it and found it to not be safe. Both manufactures recommend the rider to be looking over the top of the fairing to see and be safe. Fairings are bulky and noisy. They not only amplify the sound of the drivetrain, but work like a drum when you go over bumps. 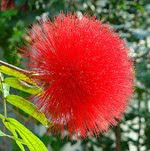 However the advantages do out weigh the disadvantages at this time of year. Moving into and with the wind is better. Its easier to move into the wind for obvious reasons, but with a tail wing you are pushed along. like having a sail. Because of this its best to not have the fairing held with your handlebars. A strong gust could take the bars out of your hand or steer the bike into traffic or off the road. Riding in the rain is a treat. Dry feet and body have you smiling in short order. However, rain droplets build up on the surface of the recumbent and when you go over a bump, come off and hit you in the face, all at once. It wakes you up. Arriving with a dry body and feet after past years of rides of being soaked, is amazing. Fairings really look odd. A driver seeing a faired recumbent cant stop looking. Some riders may not like this, but I like being seen around speeding automobiles. With a faired recumbent you are given more space to pass. I have never been cut off by a driver while riding a bike with a bubble. With the the return to warmer weather, removing the Fairing is like being able to strip a layer of clothing. The bike becomes smaller, lighter and easier to corner, making the return of Spring for us Recumbent cyclists, an even nicer experience! Too Windy and Too Cold? Did you know that riding a bicycle at twenty miles per hour , 98% of the work is fighting the wind? Well then, Doesn't it make sense to ride a bike that the wind sees less of you? Recumbent bicycles have a rider in a position that has less frontal area. Its different with some designs, but if you have ever spent any time on a recumbent riding in the wind, you know exactly what I mean. There is a noticeable difference with the cold too. Less wind on the body equals less wind chill. The effect the wind has on the body when there is less for the wind to see, make for a less windy ride. Fairings make things even better. Sitting in a greenhouse on a cold sunny day will have you warmer then you might expect. I can remember a fast ride on a cold day with no jacket, warm and happy behind my Windwrap fairing. If there was ever a reason to ride a recumbent, riding in the cold wind is surly one of them. Dry roads on a cold day for a ride to a near by greenhouse will have you smiling that silly recumbent smile once again!